For all of its mining of mythology and legend to produce its broad base of wesen, Grimm largely steers away from some of the more obvious choices in the monster canon. There’s never been a vampire-equivalent character present throughout the series, its animated man episode owed more to Jewish golem myths than Mary Shelly’s Frankenstein, and despite having a wolfman as one of its leads it’s distanced itself from that story’s archetypes. (Rather forcefully as a matter of fact, as when Nick asked in the pilot if he needed silver bullets Monroe’s response was “Are you an idiot?”) The beasts of Grimm occupy a separate space from the classic Universal monsters, moving away from pop culture interpretations of myth in favor of making their own. “Lycanthropia” takes one of the series’ biggest leaps into that category as Grimm tells its first proper werewolf story, beginning and ending with loud howls in the light of the full moon. Yet going past that point it’s an episode that’s refreshingly light on the other cliches, opting to take elements of that framework and tell a standard Grimm story. 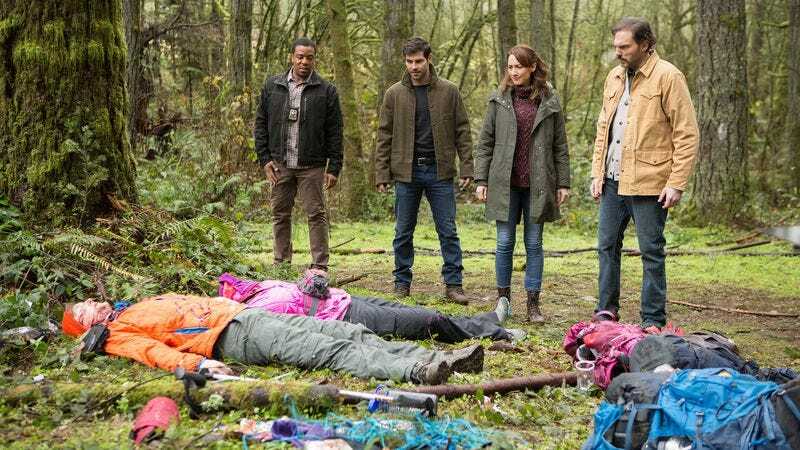 And in the process, it also finds a way to introduce yet another complication to Team Grimm’s life, one with potential for big dividends in future episodes. Rather than going the route of a man unwittingly changing into a monster—one they’ve previously explored in episodes like “12 Days Of Krampus”—Grimm keeps the werewolf myth rooted by attributing it to the world of wesen diseases. It’s an idea the show has successfully traded on before in installments like “The Grimm Who Stole Christmas,” “Cold-Blooded,” and “Quill,” the concept that there’s a bunch of conditions that are dangerous to wesen alone and that the normal world is unaware of for that very purpose. Here, it’s a rare Blutbad genetic condition where the full moon pushes them into full psychopathic woge state, a condition so dire that Blutbad parents would kill off young children who exhibited any signs. The introduction doesn’t strain credulity, simply making it one in a long list of things that Nick’s diaries have no record of. The shifted focus winds up being in service of a twist, that the killer isn’t Doyle but his mother (Ann Cusack, most recently seen as Chuck’s wife on a recent Better Call Saul). It’s a twist that works both because it’s not obvious right away—her fear at not having her son close that night masked by the traditional overprotective mother—and because it raises the stakes of the already unsettling moonlit confrontation. Monroe and Rosalee’s usually helpful research for once yield no palliative solution to this disaster, which leads to the combination of Doyle’s fear and Nick’s resolve escalating viewer dread for the inevitable conclusion. You want Doyle to prove their worst-case scenario wrong, and for a moment in their mother-son showdown he almost does—until the beast wins out and the guns have to go off. It’s the tragedy that lurks in many of the monster stories inspired by this affliction, that when a monster can’t be saved it needs to be put down. The most interesting part of this story comes with the closing minute reveal that Wu was scratched by Mrs. Baske in their scuffle, and he’s making some questionable noises in the light of the moon. While any ramifications of what’s happening here will have to wait for future episodes, it’s territory Grimm’s overdue to explore. 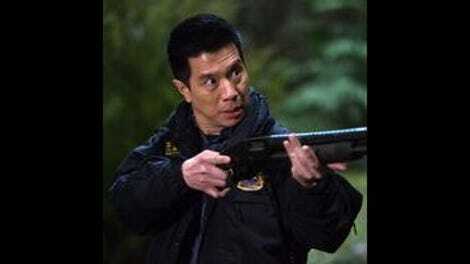 Bringing Wu into the know about the wesen world was a long-overdue move the writers finally pulled the trigger on last season, and it’s proven to be a smart decision in the ensuing months. However, other than being a more active participant in cases they haven’t done anything fun with Wu’s new knowledge. If this goes the distance to turn him into a Wu-wolf, there’s much more potential than his Aswang freakout or post-cursed cookie eating binges, an awareness of what’s happened to him tying it closer to the rest of the story. Once again, Renard and Adalind are a few levels away from any of what’s going in in the main plot, except this time they’re pooling their resources as Renard shares his news about Diana. Sasha Roiz and Claire Coffee always enjoyed a particular chemistry back in their early days, founded on a mix of physical attraction and shared goals between their characters, and despite circumstances now radically different between the two that chemistry is still present. There’s so much history between them, even leaving Diana out of the picture, that in their coffee shop meeting it’s unclear if they want to embrace or stab each other. And this newfound “alliance” is a story that manages to justify their distance from the rest of the cast, efforts to reclaim their daughter now intertwined with Renard’s discovery that Adalind’s powers are back. It’s an alliance that may not remain secret for long, as Eve remains fixated on the truth of what happened to Dixon, now breaking into Rachel’s house and uncovering the HOPE-style poster Hadrian’s Wall dummied up to lure Renard into a campaign. It’s another welcome tightening of Grimm’s disparate stories as Eve contacts Nick and Hank for a typically abrupt meeting, planting the seed of doubt over just what their captain knows. While Renard’s not yet in the villain’s camp, still postponing an alliance with Black Claw, Team Grimm knowing that alliance is on the table hopefully means he’ll be pushed in one direction or the other soon. This Week In Portland: Rachel’s townhouse appears to be located in Northwest Portland on 17th and Irving, only a few blocks from your humble reviewer’s cozy apartment. Know Your Wesen: It’s an all-Blutbad installment tonight. Any readers who didn’t understand the reference in the headline or subhead needs to follow this link right away. Nick finally gets the vault door open! This yields multiple reveals as he finds a place to conceal the Splinter of Destiny, uncovers a pit whose bottom is far out of sight, and lets us know that David Giuntoli is every bit as ripped and capable of #ShirtlessRage as Roiz is. Adalind caustically suggests to Renard that since she has a child with both Nick and Renard, maybe all three of them should live together. That is a sitcom I would watch every episode of.